Who put the best posts on an artist's blog this year? 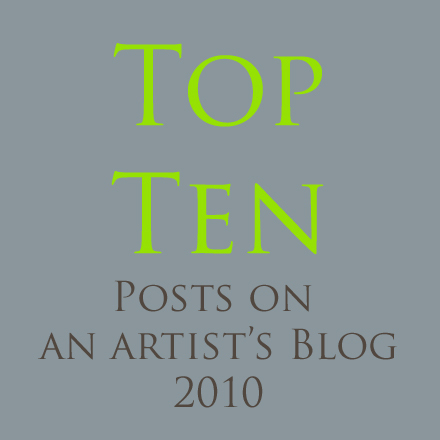 The following ten caught my interest, and this is the post where I remember them for their excellence in blogging. There are no repeat artists from previous years, although I have to note that Claudia Hajian, Museworthy, and Gregory Sullivan, Sippican Cottage, whose blogs won this award in the past, continue to bring forth superior blog posts on a regular basis. See the Top Ten, 2008 and Top Ten, 2009. Award winners are welcome to copy and paste the award jpeg on their blog. No attribution is necessary. 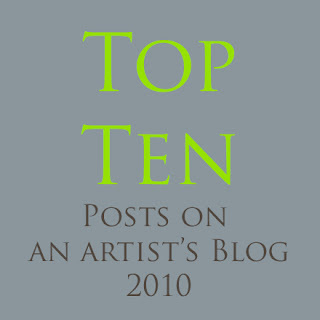 Here are my choices for the year 2010, Top Ten Art Blog Posts. A painting trip through rural and small town California. Oil paintings, summer heat and tonal poetry. Tracy goes to the Vermont Studio Center Residency in the wintertime and paints like a hermit. She gets in artistic trouble, paints her way out and makes the brilliant. 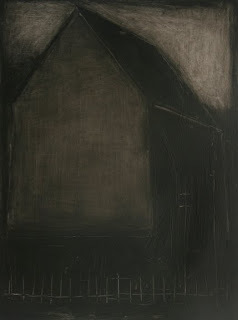 This post is an in-studio look at The Black Paintings. "Ask Stape," is the tag line that Stapleton Kearns uses at his blog. 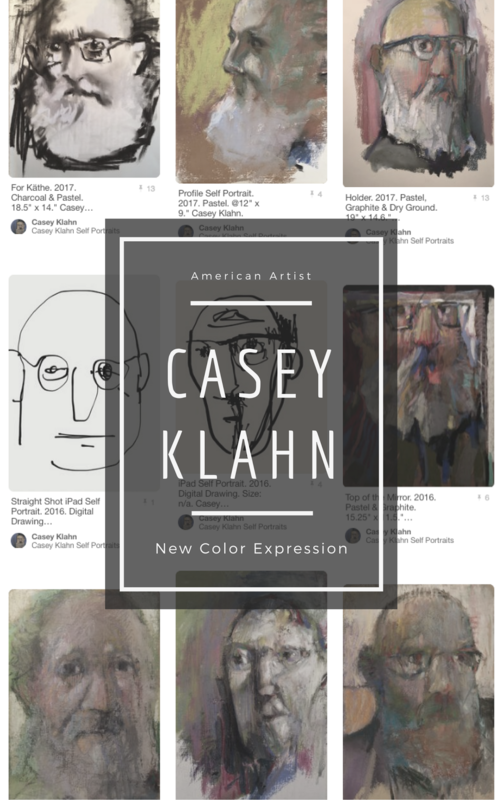 In his own words, "I present some essays on painting, art, and hopefully amuse you some at the same time." 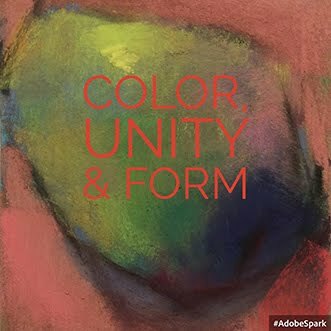 More than that, this artist's blog is one of the best teaching blogs out there. Stapleton also received the Making a Mark Award: The FAQs and Answers Really Useful Medal for being an all-around great resource to artists who blog. Every week I look forward to Katherine's report of what has happened in the art world, and on art blogs all over the world. Her posts tell about important and interesting exhibits, especially those in her home city of London. 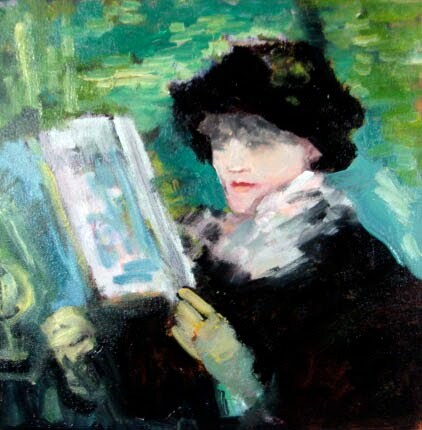 Also, she looks at what has been posted on artist's blogs, what's up in the art economy, and on the internet of particular interest to artists, arts professionals and collectors. 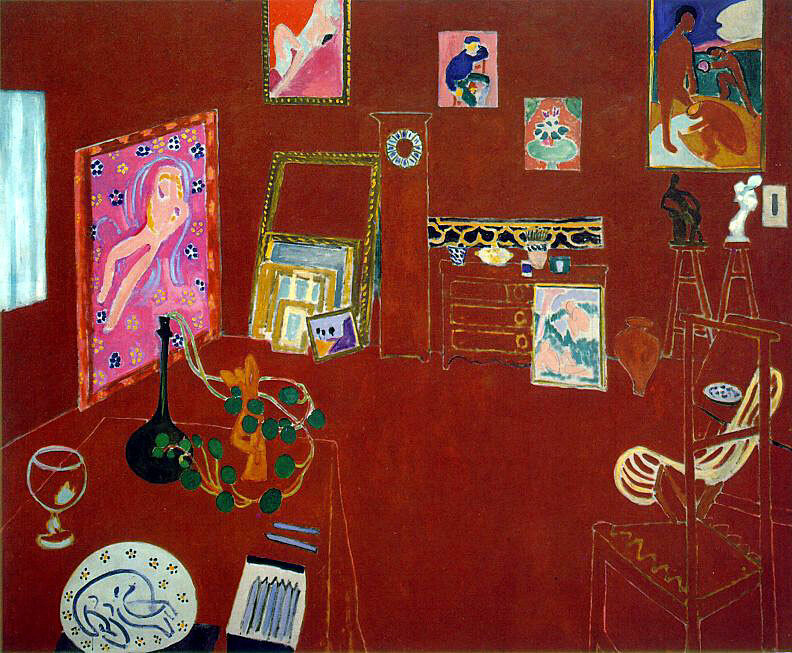 Prose from artist Kelly Marszycki, and an hommage to Matisse in a red theme.. Savor this. "I cannot breathe. I feel myself drowning in this desire to create something..."
2010, Oil on 12 x 12 stretched canvas. Celeste is a powerhouse of an artist who lives in Portland, Oregon. She is great at posting daily, and her process is what it's all about. She portrays the fun that she has living the artist's life. I had the pleasure of meeting her in August when I made a road trip to California. "Painting with black is delicious fun." This year I noticed more posts by artist bloggers written as a series. First up is Katherine van Schoonhoven. Katherine took a sailboat trip to Alaska via the Inside Passage, and live blogged the whole thing! That has to be the greatest adventure posted this year, and her paintings, journal sketches and notes are a must see. I chose one post as representative of her live-blogging series. Astrid went to Paris and took a long workshop with expert figure artist, Margaret Dyer, of Atlanta, Georgia. What else do you need to know? A dream workshop for an artist. Astrid's wonderful work can be seen here. 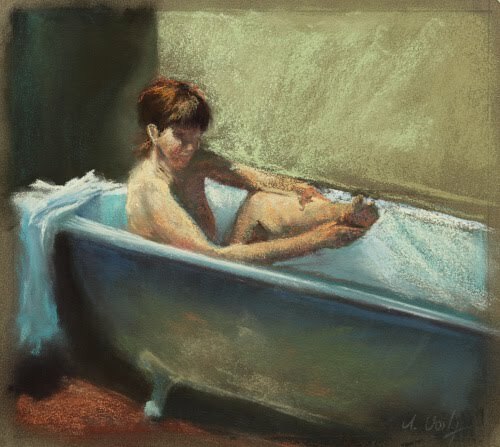 I took an online class from Deborah this year, and have been a fan of hers for many years. Her annual trip to Telluride, Colorado is live-blogged in this post and others in the series. The prestigious event: The Telluride Plein Air Festival. Washington artist, Lisa McShane is always up for a workshop, and does yeoman's duty reporting her trips on her blog. This series features the Mitchell Albala workshop in western Washington. 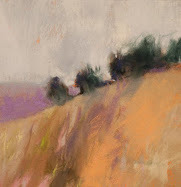 Lisa is a successful landscape artist whose work is a treat to look at, and I enjoy following her blog. What a wonderful list Casey - and I'm honoured to be included! This one will get a mention in the first "who's made a mark this week?" of 2011. Casey- thanks so much for the mention! Happy New Year to you and your family! Thanks Casey- What a great present to go through and look at each of the 10 blogs! Some were totally new and I had so much fun filling my eyes and mind! Happy New Year! Great list Casey! Happy New Year! Casey! Thank you! You raise the bar for bloggers, that's the truth. Happy New Year, and keep the path to the studio clear! Casey, Thanks so much for choosing me as one of the ten. Meeting you this year and following your cool art discussions has also been "delicious fun". I enjoy your blog and appreciate the positive energy you provide in every post. Happy New Year! Wow ... thanks for highlighting these great blogs that are worthy of your list. I'll have to take a look at the ones I've missed. Happy New Year! Great stuff, Casey, and some new blogs for me to explore in this list. Very best wishes for a happy, healthy, and successful 2011! This is a great list, Casey - thanks for posting it. While I follow some of these blogs, it was still great to go back and revisit those particular posts that I may have missed. And, if not for you sharing, I'd have missed some nice work and great content. Thank you Casey! I'm so happy and humbled to be included. Happy new year! thank you so much! It feels nice to belong to this group. This trip to paris was very special indeed and who is interested, Margaret Dyer will be back this year as well. Wonderful choices. I always read your blog but rarely comment--Happy New Year. Thanks to all for reading this post and the links. I'll answer each comment after the studio session this morning. The kids are back at school - whooopeee. Casey, thanks for giving me a good list to check out. I welcome the chance to learn from other art bloggers. Thank you for reading here, Eric.